With industry experience spanning over 50 years, it would be no understatement to say Kent Mobility’s Managing Director John Payne knows the trade like the back of his hand. Never short on industry stories and opinions, THIIS talked to the venerable mobility expert to discover how the industry has changed over the years, the shifting nature of manufacturer and retailer relationships and the potential impact of personalised wheelchair budgets. I started in this industry having been involved in the motor trade back in the late 60s and early 70s. My old boss owned a car garage and in addition to working on cars, we also worked on the old Ministry trikes for disabled drivers. Mini Morris 1000s were given out in those days and I got into the market by repairing these machines building foot steered cars for thalidomide customers. Eventually, there was a sort of upheaval from the disabled community as they wanted better pieces of equipment so the government ended the trikes. We had around 400 trikes on our client list which we were servicing and mobility allowances where introduced instead so over time we moved into the private market and started selling scooters and wheelchairs. I moved from the workshop and was on the road meeting customers in the late 70s and early 80s, covering Southend right down to Portsmouth. That willingness to take on any project sounds like a great environment to start off in the industry. How did Kent Mobility come to be? My old boss passed away and his son-in-law didn’t want to take the business on as he was just interested in the car garage and the business was sold. We didn’t believe in the vision of the new owners, so my wife and I, who had also worked for that company, started Kent Mobility around about 1990. She had been a rep focusing on rehab equipment on the roads, so we decided to run the business following our old boss’ ethics, treating people how you would like to be treated yourself. That was really the foundation of Kent Mobility and those ethics have stuck with us throughout the years. Would you say that foundation has been key to Kent Mobility’s longevity? The business has grown over the years because we have stuck to that same idea introduced by our old boss, that being if it is safe to do, we’ll have a go at doing anything for our customers’ want and need. We have been involved in a number of unique projects, for example working in conjunction with Invacare & Kuschall to get a customer to the base camp of Mt Everest and even sending out bespoke equipment to South Africa and Mauritius. We’ll take on anything as long as we can do it safely and again, I just feel like we should never say no unless of course, it is unsafe. Have there been any circumstances where you have had to refuse a request? I did refuse a chair that a chap wanted to do a bungee jump in once. Having been in the industry for so many years, what has been one of the most notable changes over the years as a retailer? In my opinion, the honesty has altered an awful lot over the years. In the past, it seemed manufacturers would have a dealership that they supported 100 percent and would give us an area where they wouldn’t put another dealer in it. That really seems to have changed now. Today, it seems some major manufacturers are putting a lot more emphasis on the number of boxes shifted. The environment definitely feels different to how it did before and as a dealer, sometimes it feels like as long as we buy a box, some manufacturers are not too concerned about what happens once that box is sold. We have manufacturers with sales reps in the region who are under pressure to hit their sales targets, so this is either passed on to the retailers they work with or they open accounts with more retailers in the same area to increase their sales. So, there is a lot of short-term thinking in regards to building strong relationships between retailers and manufacturers I would say. What do you think the effect of this has been on retailers? In what I would call the respectable side of the retail market, referring to companies that have been operating ethically in the market for years, we have had a bit of a bad deal from some of the manufacturers out there. I get the impression that as long as someone open’s up to their chequebook, some manufacturers will be all too happy to open them up an account. We have even had a fish and chip shop on the Isle of Sheppey selling scooters! At the end of the day, these products are pieces of medical equipment, so it is important that they are sold by reputable dealers, however, bricks and mortar stores really are struggling at the moment and an awful lot more support is needed. With the rise of internet-selling and the costs associated with running physical stores, especially in this industry where assessments play such a key role, what can bricks and mortar stores do to stay relevant and compete? The internet has certainly seen a rise but we’ve noticed that over the past few months, there seems to be a slight trend towards customers turning away from the internet and coming in to see us. This is especially true for the bespoke items. They want to sit and talk with someone face-to-face, particularly when it comes to the bigger ticket items. I think it boils down to offering the best customer service possible as a bricks and mortar retailer but our ability to offer that is often hampered by manufacturers. What issues have you found working with some manufacturers? The service from some is absolutely appalling when it comes to spares and backup support. Quality of a product when it arrives with us also seems to cause problems. More people in the trade I meet and talk to seem to be suffering the same problems. In your experience, would you say this is more indicative of the larger or smaller manufacturers? The larger manufacturers have probably given us the most amount of issues although certainly not all of them; some really do give support above and beyond. A lot of the retailers I know are starting to look at smaller companies that are bespoke and give a good backup service. I work with a company in Italy for example and we ordered a manual, specialised chair for a customer. When the chair arrived and the customer came in, we realised we had made a mistake on the brakes – they were too long and he could swing the leg rest away. He was sat in the office when I contacted the Italian company with the problem and they came back with an apology, stating they were partially to blame that they had not warned us and that we would need different brakes to fix it. They said they would send out the new brakes as an emergency for us that day and that we should receive them by two o’clock latest the following day. They were in the office by 12’o’clock. That is what I would call truly excellent service. On the flipside, I have had another chair that I cannot do anything with for over a month because parts do not fit properly and it has taken three weeks to get an answer from the manufacturers, who informed me it would take a further two weeks to get the parts to me. What is the impact of these types of delays on your business? That last example was a £4,500 chair that the customer wanted, so when it arrives and isn’t right, they are asking us why it doesn’t work? It reflects badly on us and our reputation. Customers are not interested in excuses and nor should they have to be. In my opinion, the big manufacturers are driven largely by what the NHS is purchasing, which is usually down to price, resulting in a poorer quality product. This stands at odds regarding what we are trying to achieve in retail, which is a product that we can deliver to a customer and ideally not have to hear from them again because it is working so well until they need it serviced in a year’s time. Would you say this focus on the NHS has driven down product quality? We used to have an NHS range and a retail range in the past but now we haven’t. Now, we have an NHS retail range, built to meet the NHS cost needs and then put out on the private market for three times the price. My personal view is that we will not get a decent product built in this country until we change the NHS procurement process. Do you think the introduction of personal wheelchair budgets will help? Hopefully, but it remains to be seen. Wheelchair Services up and down the country have been struggling to meet the needs of users and in the South-East, Wheelchair Services have been picked up by contractors. I’ve found that whereas we used to do around 30 wheelchairs through the voucher scheme, it has dropped to practically nothing since the external contractors have taken it on. Simultaneously, we have heard stories that the time taken to repair issues and the customer service provided by many of these organisations can be lacking. It will be interesting to see how the new system is rolled out and if it improves the process of receiving wheelchairs for users. What do you think the effect could be on the market if more customers began using the wheelchair budgets with private retailers? If it does work and people have their own payments, I believe it would give manufacturers a real push to prioritise the service they provide because the retail market cannot afford to put up with bad service and long delays. It would also give more motivation in the market to innovate and improve the quality of products on offer. The theory behind the new system sounds good, however, in my experience, there is usually a big difference between how something should work and how it does work. What would you like to see manufacturers do to support bricks and mortar retailers? First and foremost, manufacturers need to send out the spares in a prompt manner, allowing us to deliver the customer service which is often our competitive advantage in the market. A lot of the smaller manufacturers understand this but it seems that over the last 10 years, the really good smaller manufacturers, especially the British manufacturers, get swallowed up through acquisition and lose some of that service element that made them great. 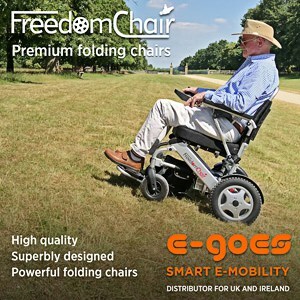 Ideally, what I would like to see is a company manufacturing powerchairs in the UK. The scooter market bubble has burst and everyone is selling a scooter but we are lacking a great British powerchair manufacturer. Is the level of service and support being offered key to how Kent Mobility chooses which manufacturers to work with? Undoubtedly. When I worked in the motor trade, we could place a vehicle off road (VOR) order and be guaranteed that the part would be supplied in 24 hours. Ironically, many suppliers in the mobility industry seem to struggle with this, even though a mobility vehicle off the road means someone could well be immobile. As a retailer, we have even had cases where we contacted the original equipment manufacturers in Taiwan to order parts for repairs because it is quicker than working through a supplier in the UK. In terms of selecting products to stock, how do you decide which products to take on? The first consideration is whether the product is better than the products we currently stock or does it fill a hole in our current range? I like to have the products examined by the workshop team to get their opinion. Our engineers are exceptional and can usually spot if a product is worth us selling or will lead to more headaches later down the road. We then consider the service elements; what support is provided and are we able to get the parts in if it does go faulty. Lastly, we look at what money we can make from the product as a sellable item and if the product is saturated in the local area. So, quality is your main consideration? Honestly, we do not need any more unreliable products taking up too much time and effort to put right for customers and it reflects poorly on our reputation as a quality, knowledgeable retailer to supply products that are undependable. Given your experience, what potential issues do you see facing the industry in the future? Cycle front ends for wheelchairs are an interesting one that I think could lead to problems, simply because there is a lack of clarification regarding just where they sit in the law. Are they a mobility scooter? Powered wheelchair? Trike? Many can go over eight-mile per hour legal limit for a class three scooter and it seems to be one of those areas where it will not get any major attention until a serious accident happens. How do you see the retail market evolving over the next few years? I think this year will see an awful lot of companies exit the market because there is just too much competing on price, with retailers selling at too low margins to operate a sustainable, well-serviced mobility company. Just like the double-glazing rush, I believe we will see a lot of online businesses get into the market with the aim of making quick cash but not sticking around to offer the repair, servicing and support that accompanies these types of products. My prediction is the industry will experience two or three bumpy years of people purchasing some of the more expensive products online and realising the customer service is not there before returning to bricks and mortar stores. To a degree, we have already started to see that. In regards to the Personal Wheelchair Budgets, we have yet to see any customers come to our store yet with a budget so we’ll be watching closely to see how the new system is implemented and if more wheelchair services are contracted out by the NHS. With the retail landscape changing so much in the mobility market, how will Kent Mobility look to compete in the years to come? The answer for us is to focus on niche products however that is not easy. If a company is going to focus on bespoke ranges, they need to do it extremely well. This strategy has helped us avoid having to accept sales quotas from reps and the pressure to shift boxes. In this industry, where the needs of each individual customer are different, dictating to a retailer how many units they need to sell is the wrong approach. We have finished updating the showroom space and now we are looking at expanding into other areas, including developing our own assessment centre strictly for powerchairs. We have the knowledge and experience in-house and it is something that I think is lacking in Kent and Sussex. There are some really interesting things in the pipeline and as the market continues to develop, it is likely we will specialise more and more in bespoke products.